Reservations no show or cancelled with less than 5 days prior arrival day, will be charged 1st night stay onto provided credit card. In the heart of the city of Oviedo, low cost hotel is situated just steps from the Cathedral and Gascon Street (Boulevard of Cider, one of the most traditional, where you can taste the ultimate Asturian and the traditional drink of Asturias, the cider). Near the Principe Felipe Auditorium and the New Palace of Congresses, surrounded by a multitude of terraces to enjoy the nights of Oviedo. In the shopping and business district, next to the Campoamor Theatre (venue of the Prince of Asturias) and the Philharmonic, just minutes from the Auditorium Prince Philip and the New Palace of Congresses. Easy access from the hotel to the Industrial Estates Asipo, Silvota and Technology Park of Asturias, very well connected to the Park Mall and Ikea Asturias Principality and the new Hospital Universitario de Asturias (HUCA). 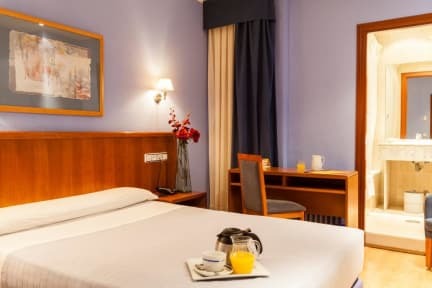 Very well connected by public transport, close to bus and train stations do not need a car to move around the city, the Cityexpress Hotel Covadonga is in the center of Oviedo. Spacious and comfortable, with bathroom (toilet and free play hairdryer), telephone and Internet connection, television with satellite channels, wake-up calls, minibar, room service and individual safe. Continental Breakfast 7.00 per person. Reservations are not present or is canceled less than 24 hours days before arrival will be charged first night in the credit card.